At 1/16 of an inch, the hemlock wooly Adelgid (Adelges tsugae) or HWA, which feeds exclusively on trees, doesn’t seem like an insect you would have to worry about, but this tiny aphid from southern Japan is extremely destructive. The HWA was first reported near Richmond Virginia in 1951. This marked the beginning of its spread westward across the United States. By 2005, 16 states from Georgia to Maine housed populations of HWA. The infestations were estimated to cover nearly half of the range of hemlock forests in the area. 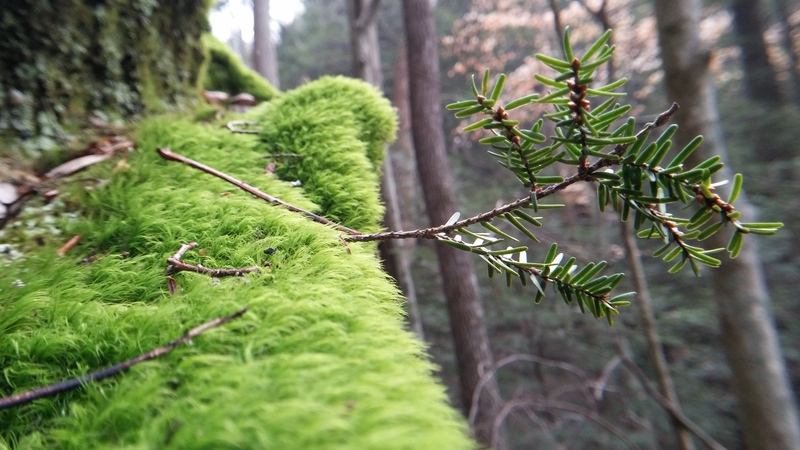 In some areas, up to 80% of the hemlocks have died due to infestation. In Japan, the HWA is controlled by natural predators and resistances in the trees. In America, the insect has no natural predators, and the hemlocks it feeds on have not had time to develop resistances to stem the tide of the insects’ appetites. Those who have never seen a hemlock forest might not understand the impact of 80% tree loss. Beautiful and stately, the eastern hemlock (Tsuga Canadensis) can stand more than 150 feet tall. They typically grow in large stands, creating their own shaded ecosystem where many species of birds, arthropods, fungi and lichens make their homes. The hemlock is what is known as a keystone species. Without the presence of a keystone species, the surrounding ecosystem collapses. Camp Oty’Okwa, whose 737 acres of land includes an estimated 300 acres of hemlock forest, has worked hard to monitor the spread of HWA and provide education to the public about the invasive species. Develop awareness of biological diversity and threats to this diversity. Develop leadership skills that would enable high school students to provide quality service learning projects for their schools and community. Participating high schools selected up to four students to be part of the HYAT. The students participated in two overnight training sessions at Camp Oty’Okwa. Advisors from Rural Action and Camp Oty’Okwa worked individually with each high school group. During the trainings, the students learned various teambuilding and leadership techniques. They focused on crafting individual service learning projects while learning about biodiversity and invasive species. Experts from around the state discussed how resource protection agencies work together to manage invasive species such as the HWA. 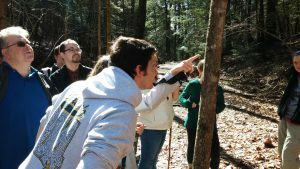 The students learned how to monitor for HWA in hemlocks, treat infected trees with various methods of pesticide application, and survey land to estimate the number of hemlocks in an area. 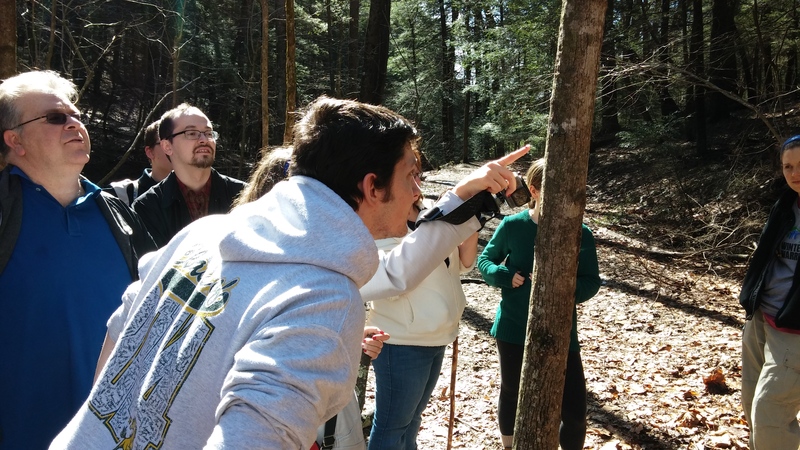 The Ohio State University Extension and Forest Service worked hand-in-hand with Camp and Rural Action to provide these trainings. After the trainings, each high school team was responsible for providing programming at elementary schools in their districts. Through this programming, more than 3,000 youths were educated about the need to monitor and treat hemlock forests for HWA if we want to conserve the natural beauty we have today. 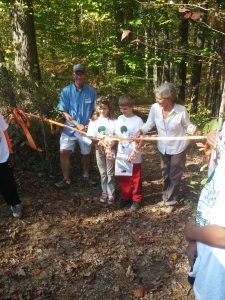 The HYAT program was a huge success, and Camp Oty’Okwa has continued to work with local organizations and agencies to monitor its property and raise awareness of HWA in the Hocking Hills region. We are excited to announce that in collaboration with partner agency Rural Action, Camp Oty’Okwa recently received a two-year $91,000 grant from the U.S. Environmental Protection Agency (EPA) to support the Youth Climate Action Team & Appalachian Green Teachers. We will be enlisting high school students & Educators from ten southeastern Ohio schools to address issues of climate change and energy management. The students will brainstorm strategies to educate and engage their communities and eventually facilitate sessions on these important topics. Under the project, teachers, students, and members of the community use outdoor spaces as teaching tools, participate in workshops focused on regional environmental issues, and conduct citizen science projects to collect biodiversity data and study the impact of climate change on local flora and fauna. As a model program, AGPT focuses heavily on curricula that directly relate to the Appalachian Ohio region, involving data about waterways in the lower Ohio River basin, biodiversity, and local flora and fauna. Rural Action uses this program to encourage behavioral changes intended to minimize the impacts of climate change and educate the community about energy projects. 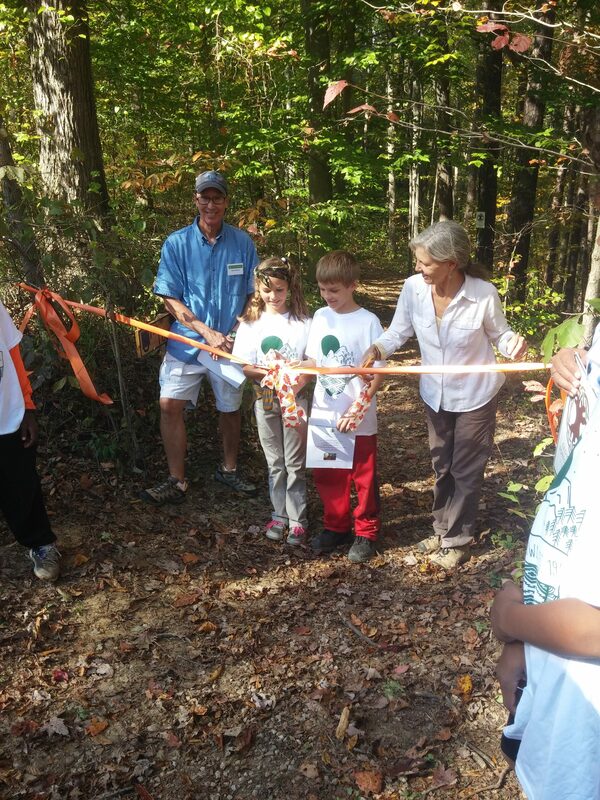 In 2016, the Old-Growth Forest at Camp Oty’Okwa was formally dedicated into the Old-Growth Forest Network as Hocking County’s representative in this network of ancient forests. Camp Oty’Okwa Old-Growth Forest is a 200+ acre forest found within the 737 acres of Camp Oty’Okwa. The forest consists of primarily older growth oak/hickory forest and mixed mesophytic forest with a sprinkling of Eastern hemlock. It is a healthy forest with no disturbance for the past 60 years. Once threatened by logging, local naturalist, Paul Knoop was able to coordinate a buy out of the timber company by a local donor to prevent the logging. This action was followed by the creation of a conservation easement to protect in perpetuity the forest from any future efforts to log the forest.